Today was a beautiful day, and the air felt delightful. Every year, I photograph the trees and greenery around my rural driveway, and the colors changes yearly. This year, the ground cover wasn't as vividly red as it used to be. 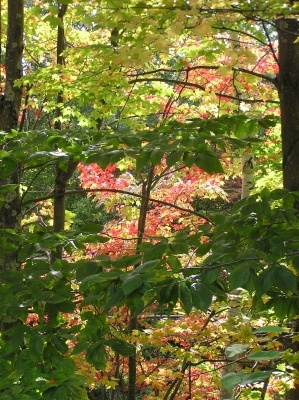 However, some of the trees glow red, peach, yellow in the sunlight and I love looking out of the windows. The lighting changes from morning to late afternoon and it's fascinating to see what colors pop out during the day. With the lovely weather, it's distracting trying to work. After a year of not making any flatware, I managed to get multiple sets of measuring spoons and salad servers made. Some are in brass/copper/bronze and some have been sent out to be silverplated and rhodium-plated. Now, I'm trying to get some silver chains made for necklaces. This Sat I am doing the RISD Alumni Sale in Providence, so I have to finish tagging all of my stock and get the car packed with my booth stuff. I rather enjoy the weather but duty calls. Back to work!